Fig. 4. - Silk fiber, magnified. (U. S. Dept. of Agriculture.) hygroscopic or absorbent quality is 5 to 8 per cent, but it can, in moist atmospheres, absorb more than this. It has less luster than linen, even when mercerized. The surface of cotton cloth is fuzzy. Cotton is not quite as good a conductor of heat as linen, but being much less costly to manufacture, is more generally used for clothing. Cotton fiber passes through many processes in preparation for weaving into cloth. When the bolls have ripened and opened, the cotton is picked and sent to be "ginned," that is, to have the seeds removed. This is done by machinery. The cotton is then packed into bales, covered with heavy bagging and bound with iron wire hoops; these bales weigh 500 pounds. The bales are then compressed and shipped to the factories where the cotton is to be spun into yarn, preparatory to weaving into cloth. When the bales are opened, the cotton is found not only tangled from long compression but is also full of dirt, bits of leaves, seeds and pods. It is cleaned by machinery which removes the bits of leaves and seeds. 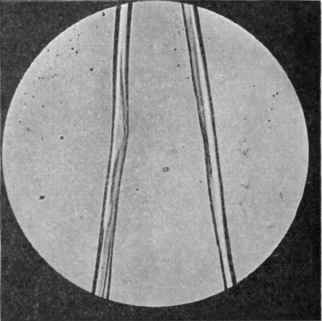 Other machinery smooths out the fibers and lays them parallel to each other; as they come from these machines they are drawn into a thick strand called a sliver. If very fine yarn is to be made, a similar process is gone through which removes all short fibers, causing much waste and therefore increasing the cost of the woven fabric. The slivers of cotton are then put into other machines which draw them into thinner strands and at the same time put in a twist, which renders it possible to make greater attenuations. These twisted strands are wound on large bobbins placed in other machines which draw the strands out into fine threads, put in a twist and wind them again on spindles. The yarn is afterwards unwound from the spindles, wound into hanks, and bleached, then dyed. 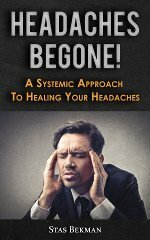 The bleaching is done by chemical processes. Cotton fiber does not take dyes easily, therefore it is necessary to treat it with some chemical preparation in order to make it take and hold the dye. It is dyed both in the yarn and cloth, and colors are sometimes printed on the cloth. Cotton fiber having no luster of its own, is often treated by a chemical process called mercerization, which not only renders the fiber stronger, but adds a luster not unlike that of linen. Flax fiber, of which linen cloth is woven, is a bast fiber which lies just under the outer bark of the flax plant. 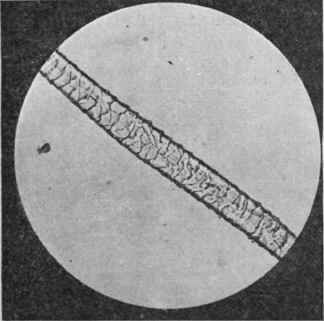 Under the microscope it appears to be a cylindrical fiber, with pointed ends, cellular in structure, with lines or cracks crossing at intervals along its length (Fig. 2). 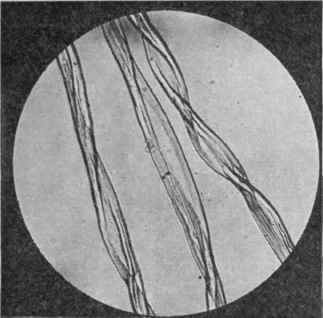 The fibers vary from 12 to 36 inches in length. They have a high luster, are stronger than cotton fiber, but have no twist, and are not elastic. Flax fiber has an absorbent quality of 5 to 8 per cent, but may reach 20 per cent. It is the best conductor of heat of the four fibers. The preparation of flax fiber for weaving involves many tedious processes. The plants grow to a height of 20 inches to 40 inches. The time for pulling, which must be done by hand, is indicated by the changing of leaves from green to brown. The plants are pulled up by the roots in clear, dry weather. The seeds and leaves are next removed and the plants tied in bundles, and the process of fermentation begun, which separates the bast fibers from the other portions of the stems. This is called "retting" and is done by letting the bundles lie in the grass in dew and sun for a longer or shorter period, sometimes two weeks. It is also retted in pools of stagnant water, in streams of running water or by the use of chemicals. After retting, the plants are dried; then the woody parts are crushed and broken away from the rest of the stem by machinery. A process called "hackling" is used to remove all woody parts from the fiber. Short and long fibers are separated in this process, the tow or short fibers being used for coarse yarns, the line or long fibers for fine. The fibers are then drawn out into a thick strand like the cotton and a slight twist put into it. This short strand or roving, as it is called, is then spun into yarn. Flax fibers also require moisture for the spinning. The warp threads must be harder twisted than the woof. Linen is bleached in the cloth or yarn, mostly the former. This is a long process because of the nature of the fiber. The bleaching is done by dew and sun, and also by the use of chemicals. By the latter method, unless most carefully done, the fiber may be injured. Linen does not take dye easily; it is more difficult than cotton to dye and does not retain the color well. Wool fibers, from which woolen and worsted cloths are made, is the coat or covering of the sheep. A single wool fiber is a hair, fine and curly, varying in length from 1 inch to 8 inches. Examined under the microscope, it is seen to have scales or serrations with pointed edges, which stand out from the fiber (Fig. 3). These scales open when warm and moist, somewhat as a pine cone does, and the edges interlock. Then as they cool, they draw together and dry, not opening again. This holds the fibers close together, causing shrinkage in the cloth and aiding in the felting process. 50 per cent. Wool fibers are more expensive than fibers of linen, not only in the initial cost of production, but by reason of the various weaves and finishes necessary to produce certain types of fabrics. Wool is sheared from the sheep either by hand or machine. These shearings are called "fleece" The fleeces are packed and shipped to the mills. The wool is first opened and sorted because the portions from the different parts of the sheep vary in quality. The wool being very dirty, is then scoured thoroughly and carefully dried; this process does not remove the burrs, seeds, and leaves, which are taken out by machinery or the use of chemicals, in which latter case the wool must be washed again to remove both chemicals and pieces of burrs. Other processes follow; blending, or the addition and mixing of other kinds of wool fiber in raw or manufactured state, or mixtures of other fibers for the purpose of securing good colors or reducing the cost of production, and then oiling to keep the fiber soft during the remaining processes, because the many washings have taken away most of the natural oil. These processes vary according as one or the other of two kinds of yarns, woolen or worsted, is to be prepared for spinning. The first is used for such materials as broadcloth, kersey, or flannel, while the second is used for serges, men's suiting, covert cloths and diagonals. 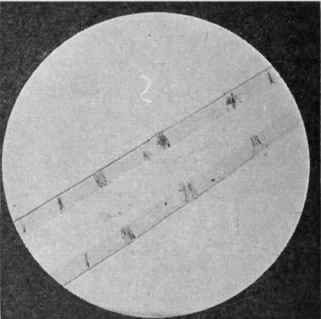 More processes are involved in the preparation of worsted than woolen yarns: in woolen yarn, carding alone is employed, while in worsted yarn many processes are employed, carding, gilling, combing, all of which have one purpose, thoroughly to parallelize the fibers in order to produce an even, close, twisted, lustrous yarn. Woolen yarns are softer and more elastic than worsted. Silk fiber is a secretion emitted by the silk worm in the formation of a cocoon, in which the worm encloses itself before its transformation into a chrysalis. It is the strangest of the four fibers, is smooth and structureless, but very elastic (Fig. 4). Silk fiber may be reeled from cocoons in length from 400 to 1300 yards. It has a greater affinity for dyes than cotton or linen, and takes the highest luster of the four fibers. It is a poor conductor of heat; its absorbent qualities are 10 per cent to 17 per cent, and may reach 30 per cent. Silk fiber necessitates great care in the rearing and feeding of the worm and the reeling of the silk. The fiber is ejected by the worm at a certain stage in its growth, from two small openings below the mouth, but it is united in one thread by a gummy liquid which hardens as soon as it is exposed to the air. The worm attaches this fiber to a branch, and by a motion of its head, throws the thread in irregular loops, somewhat like a figure eight. At first, it can be seen through the gauzy thread, but later is lost to view. It continues working until the cocoon is completed with the worm inside. The cocoons are then gathered and heated to destroy the chrysalis; then sorted, and those whose color, fineness and luster agree, are kept together. Before reeling the silk, the cocoons are dropped into hot water to loosen the gum which has held the fibers. All silk unfit for reeling is wound off, and then, with a brush, the reeler finds a continuous end from each cocoon. These he passes through an agate ring, twists them with a fiber coming from another ring, separates them again, and passes them through another ring to the reel, where they are wound into a skein. This silk is harsh, due to the gum which still adheres to it. The bundles of these skeins as sent to the manufacturer are called books. The further preparation of the silk at the factory is called throwing. Several strands of silk have already been twisted in making the skein, but the strand is not yet strong enough for weaving. The raw silk is wound from the skeins on to bobbins, and then cleaned so as to rid it of knots or irregularities. The threads from several bobbins are then united to form one, which is spun to give it the necessary twist. Two kinds of threads are made: organzine, used for warp, two threads twisted in opposite directions, then together, but twisted so tight that the luster is lost. Tram is the filling thread in silk cloth, made of two or more threads having no twist, which are put together and twisted enough to hold for the weaving process. The silk is then cleaned, that is, boiled off to remove all the gum; but washed in a warm solution, if only part of the gum is to be removed. The silk is chemically bleached if all the coloring matter is to be removed. The waste silk which cannot be reeled is washed, then carded and spun in a thread; it is called spun silk, in contradistinction to the other. Experimentation has resulted in the production of substitutes for silk of varying values. Silk is given color either by yarn or piece dyeing or by printing.